Tesla Inc. has spent more than $100,000 lobbying specifically on issues related to electronic vehicles and $450,000 lobbying the federal government overall over the last year and a half, according to lobbying disclosure records. Despite the expenditures, Tesla CEO Elon Musk insists the company does not need such breaks. Musk publicly rebuked President Trump last week when announcing his decision to quit a White House advisory board over Trump's decision to leave the Paris climate accord. 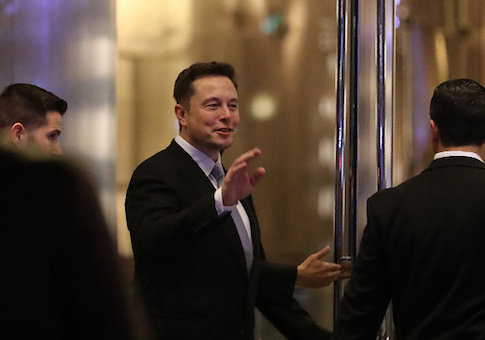 Musk and Tesla shifted their lobbying strategy in recent months in an apparent attempt to try to reach Republicans in Congress and the Trump administration more effectively on "green" energy issues benefitting his companies. SolarCity, a solar energy company that Musk merged into Tesla Inc. last fall, earlier this year parted ways with two major Democratic lobbying firms—Podesta Group and Roberti Global—and hired at least one Republican lobbying firm instead. Over the past year and a half, Tesla Motors and Tesla Inc., paid four outside lobbying firms $260,000 to lobby Washington on its behalf. Of that, at least $115,000 was spent on issues related to electronic vehicles, according to lobbying reports. The company devoted another $190,000 to its in-house lobbying operations in the first quarter of the year. The in-house lobbyists focused on "discussions regarding electric vehicle manufacturing and sales policies and regulation," as well as "discussions regarding issues impacting [electronic vehicle] manufacturers regarding autonomous drive vehicles," according to lobbying records filed with the Senate. Meanwhile, SolarCity, when it was operating separately from Tesla last year, doled out $280,000 to three lobbying firms and spent $660,000 on its in-house lobbying operations. The Podesta Group, whose chairman, Tony Podesta, is a major Democratic fundraiser and brother to Hillary Clinton's first presidential campaign manager, received most of those lobbying dollars—$150,000 for 2016 alone—before Musk ended the lobbying contract in April. The Podesta Group stood to benefit from its ties to Clinton heading into the November election. But after Trump's surprise victory, it lost several major Silicon Valley clients, including Alphabet Inc., the parent of Google after a 12-year relationship. SolarCity also ended its contracts with Roberti Global in January, two days before Trump was inaugurated. Vin Roberti, a top Democratic strategist, has worked for various Democratic campaign committees and has advised Sen. Chuck Schumer (D., N.Y.) and Rep. Steve Israel (D., N.Y.), a former chairman of the Democratic Congressional Campaign Committee. Tesla Inc., turned to Jeff Burton to lobby on its behalf in February. Burton previously served as chief of staff to Rep. Mike Conaway (R., Texas), who currently is heading up the House Intelligence Committee investigation into Russia's alleged meddling in the 2016 presidential election. Burton also had served as director of outreach to former House GOP Whip Eric Cantor (R., Va.). Prominent conservatives, including the Heritage Foundation's Stephen Moore, have said Musk's public spat with Trump comes as no surprise because the political climate in Washington since Trump's election has pivoted away from the "green" tax benefits that have helped Musk's companies during the Obama administration. Moore called the "green-energy" tax credits from which Musk benefits "low-hanging fruit" ripe for cutting in the upcoming tax reform debate. The Los Angeles Times in 2015 estimated that Musk has benefited from nearly $4.9 billion in state and federal "green" tax subsides. Musk said on a recent earnings call that he resents reports crediting his success in part to the subsidies, arguing that the credits and deductions help the competition more than they help Tesla. This entry was posted in Issues and tagged Elon Musk, Green Energy, Tesla, White House. Bookmark the permalink.